The SIOI and the United States Diplomatic Mission in Italy are launching the first international simulation of the Arctic Council in Italy. The Italian Society for International Organization (SIOI – UN Association of Italy) in partnership with the United States Diplomatic Mission to Italy, inaugurates “One Arctic”, the first simulation of the Arctic Council for youth to be held in Italy. 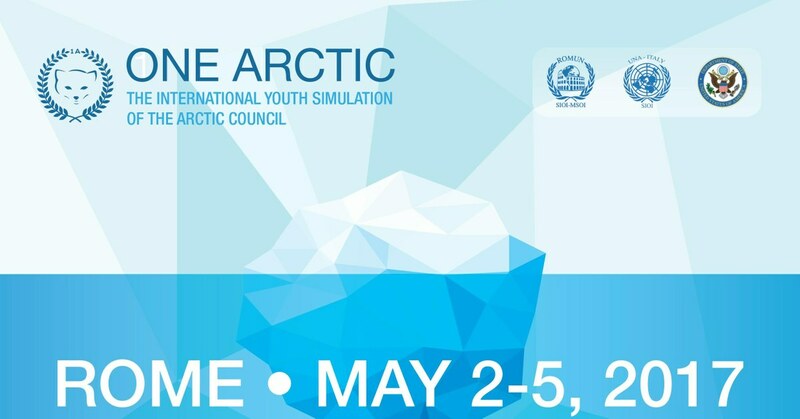 Talented young people from the Circumpolar countries and from all around the world will gather in Rome at the SIOI headquarters and at the Ministry of Foreign Affairs and International Cooperation from 2nd to 5th of May 2017, to negotiate feasible and innovative solutions for safeguarding the Arctic region. Participants will be involved in the deliberations conducted through the Working Groups (PAME – EPPR – CAFF –SDWG), the Senior Arctic Official’s (SAO’s) plenary meeting and the Ministerial meeting in order to debate the best practice and policy for the proper management of hazardous waste, for the improvement of economic and living conditions for arctic communities, and for conscious and sustainable exploitation of resources to face the impact of climate change. Those who demonstrate deep knowledge of the topics dealt with, excellent public speaking, negotiation and leadership skills, will be rewarded as Best Delegates. “One Arctic” is an initiative supported by Italian and foreign institutions and Universities, including the representations of Arctic Council’s members. It intends to promote further training of youth in international relations and to develop their capacities and skills.